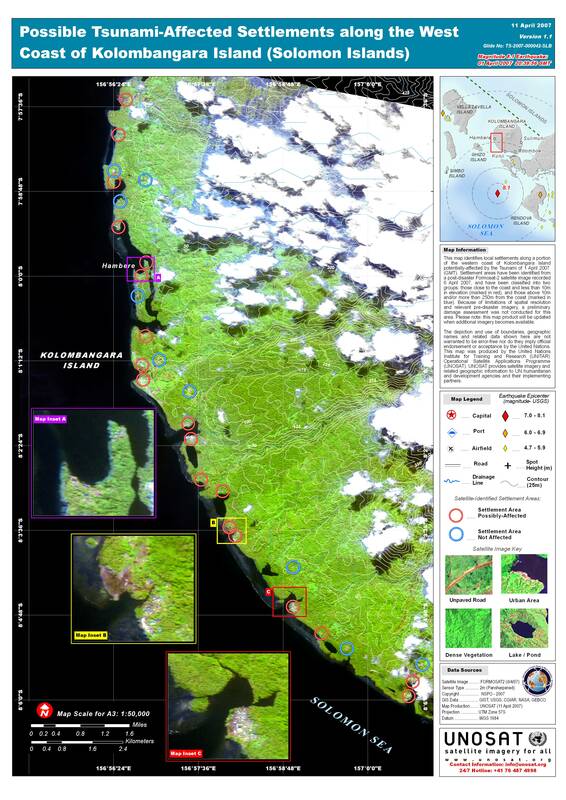 This map identifies local settlements along a portion of the western coast of Kolombangara Island potentially-affected by the Tsunami of 1 April 2007 (GMT). Settlement areas have been identified from a post-disaster Formosat-2 satellite image recorded 6 April 2007, and have been classified into two groups: those close to the coast and less than 10m in elevation (marked in red), and those above 10m and/or more than 250m from the coast (marked in blue). Because of limitations of spatial resolution and relevant pre-disaster imagery, a preliminary damage assessment was not conducted for this area. Please note: this map product will be updated when additional imagery becomes available.